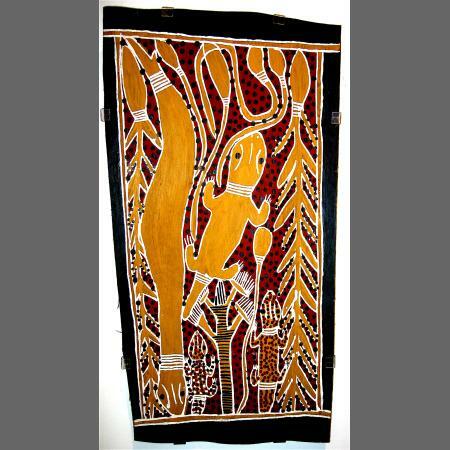 Bula'bula Arts has a number of emerging artists, painting on bark or on canvas in bark-style and on logs. Billy Black has complex arrays for complex stories, and beautiful raak. Gladys Womati offers us the East wind as a neat set of cherron'd stripes running from top to bottom of the canvas: sublime abstraction. J.B Fisher on bark or canvas can be at once rough and energetic, with passages of fine detail. This is not a school with a style, but twelve artists working with great freedom, sketchy or fine-lined as they choose, within an established set of practices. There is no repetition of 'the masters' — though Gladys Womati is the daughter of George Milpurrurru — but a fresh coming at the thing. Different tastes will choose different painters, some taking the rough — Richard Birrinbirrin's Union jack-like canvas — some the smooth. But each bark, canvas, or log repays a good long look. Birrinbirrin's work has represented Ramingining at Madrid. The ochres are traditional, working equally well on each ground: but to the tradition something new is being brought. Some of the work is risky, consider Elizabeth Nyuguwanas people, snakes, footprints. All of the paintings, to revive that old word from the Existentialists, are authentic.